I’ve written in the past about the revitalization of Towaco’s train station adjacent downtown, and it’s time for an update on the latest happenings at one of the town’s top shopping spots. 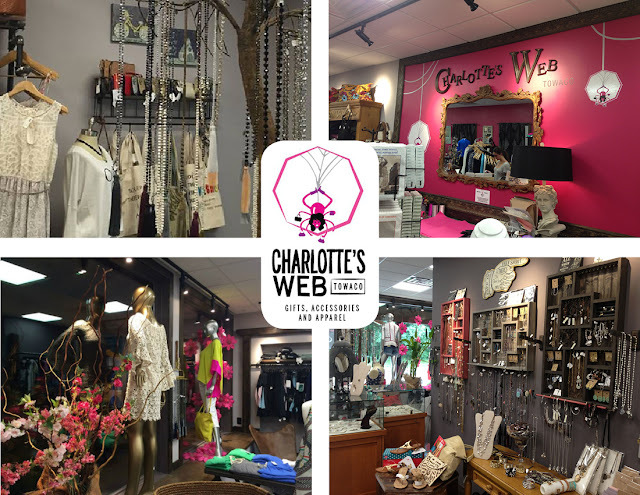 Charlotte’s Web Boutique is the brainchild of former lawyer, Lisa Stathis. After a lengthy and successful career in law, Lisa took a sharp turn down the road less travelled and followed her dream of opening her own store. 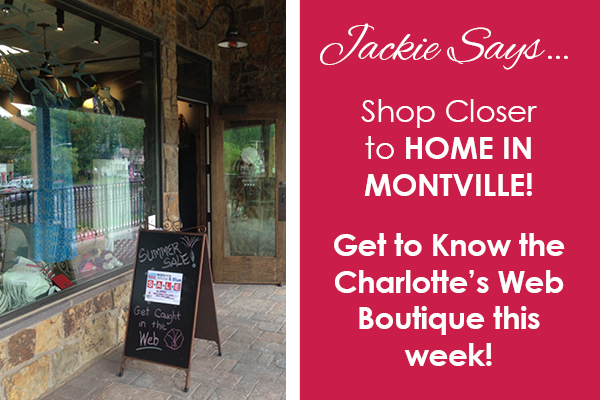 As a longtime resident of Montville, she was aware of the town’s general lack of places to shop. Lisa wanted to give her hometown an alternative to soulless big box shopping. And you will find choices at Charlotte’s Web! Whether you’re 15 or 50, you’re going to want to try something on. I barely made it a few feet inside the door before I started piling up clothes to take in to the dressing room. Along the way I spotted perfect gifts for my daughter and fun cards to give with them! Every inch of this store is covered in options I’d never find anywhere else locally. Lisa has put a lot of energy in to finding clothes and accessories by small companies at a wide range of price points. She might not be able to undercut the big boxes on prices, but there’s no questioning the quality and affordability she offers. Teenaged girls looking for playful earrings and businesswomen who want to step up their style will all find something to love here. Lisa is looking to add even more vibrancy to downtown Towaco and to promote small businesses by hosting a regular series of Girls Night Out events. The next event is on September 15th from 4:30 to 7:30 and you won’t want to miss it. Every $50 you spend gets you another entry in the raffle, and the prizes are amazing! 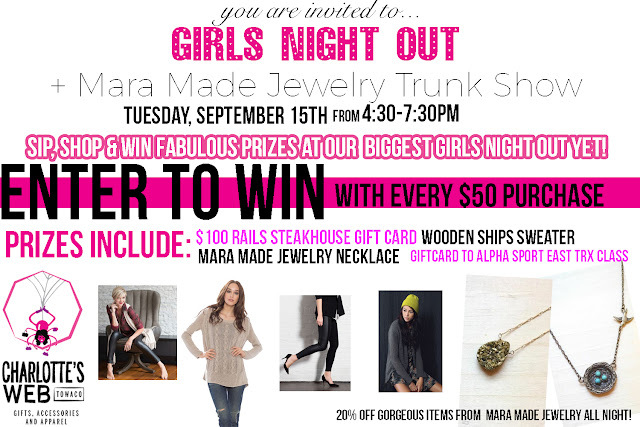 You could win a $100 Rails Steakhouse gift card, Wooden Ships Sweater, necklace by Mara Made jewelry or a gift card to the new Alpha Sport East TRX Class. The event will offer sparkling wine & delicious snacks by Rails Steakhouse next door. There will also be a special sale on the trunk show by Mara Made Jewelry. Save 20% off on chic, hand crafted pieces! I hope you’ll all drop in and give some support to this local treasure. Remember that shopping local keeps our downtowns from becoming ghost towns!